Don't let the fun colors fool you, these are serious tournament grade bocce balls. The 107mm balls are made of resin with solid one-piece construction. With this set you get fun colors and tournament grade quality all packed into a beautiful wooden carrying crate. The set comes with 2 sky blue, 2 red, 2 burnt orange and 2 mint colored balls. 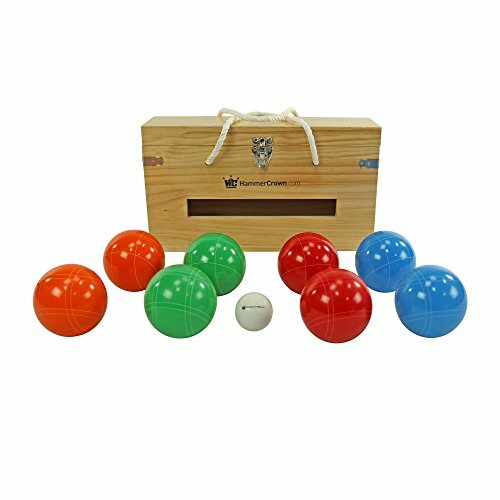 4 of the bocce balls are etched with a single stripe design and 4 balls are etched with a double stripe design allowing for 2 or 4 players to play with this set. Fun for the entire family as well as the serious bocce player that wants to add some color to his or her game! If you have any questions about this product by Hammer Crown, contact us by completing and submitting the form below. If you are looking for a specif part number, please include it with your message.